I discovered this detachable column Altapro with a pistol grip. It really rocks. It gives you every angle and dimension possible. I don't see anything else even close to that on the market. Or am I wrong? As far as I undersand you ce get pistoll ball head separate. About choosing tripod. 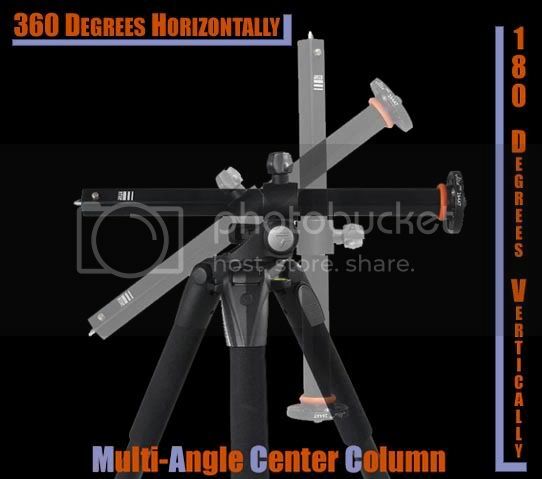 Try to look at carbon tripods and add separate weifeng fluid head to them. If you need to just install additional camera you could safely use cheap ($20-25) tripods, but they must allow you to attach bag with additional weight. It is carbon fiber! Check vanguard's web-site. Crazy people at BnH were trying to sell me Manfrotto as "the only option available". But I did some research. This one is unrivaled at this moment in its weight/price category. I'm using heavy old bogens, 3033 and 3040 with 3036 heads set to their lightest drag. Work great because they are nice and stable. All the lightweight tripods I've used tend to vibrate or flex too much for my taste. I'd love to have one. But it will also mean a lot of hassle with its transportation. I'm doing some 1manband runngun stuff and documentaries, so its light weight perfectly suits me. I got a Manfrotto head as an add-on yesterday. Now it's even better. But having vinten wouldn't hurt me too. It is very good idea to have plastic bag with you if you use light tripod. So you could fill it with sand, water, etc and increase tripod weight. I use the weifeng/e-image/fancier EI 717X . I payed extra to get the taller version cause I think the normal version that's 1.4m tall is pretty useless for narrative filmmaking where you need eye level shots. Cheap and very good. If I had more money, there's no doubt in my mind I would get the libec RS 250 or RS 350. Guys, check those tripods out. For what they cost, they are the best in the world. They can pretty much beat the crap out of most expensive tripods from schatler/manfrotto/vinten that cost 2000 and 3000$. Any links to RS250 and RS350? Also EL717 is available in three sizes actually - something around 1.38m, 1.55m and 1.8m as far as I remember. Do you know that fancier made much better video oriented tripods? FC line, as I know FC-490 and better tripods are very good. I just do not see them available yet. I was at a wedding the other day where the videographer had one of those 717 tripods. I was thinking of getting one until I talked to him. He said it was just "ok" compared to a nicer bogen. He did say it was better than other cheap designs of the same price though. It looked fairly well made(better than anything else in the same price range) and was fairly light but IMHO it wasn't up to manfrotto/bogen quality though. I ended up getting another bogen on ebay for cheap so I could use the same camera plates anyway. >Also EL717 is available in three sizes actually - something around 1.38m, 1.55m and 1.8m as far as I remember. >Do you know that fancier made much better video oriented tripods? >Any links to RS250 and RS350? As for RS250 and RS350 reviews, it looks like parts of reviews had been written by marketing guys. I didn't say that it is false, just that some parts looks loke not be from reviewer. As for FC-470, generally, I am also looking for it to test it out. This thing must be good for HDSLRs. Any ideas about affordable steadicams? I tried Glidecam Pro 2000, but couldn't balance it. Could balancing GH2 be different if compared to bigger 5Ds or 7Ds? @GOODEMPIRE - please, make specific topic. This one is about tripods. I have the standard Fancier tripod from Amazon. I really like this tripod, but I wouldn't mind a better one or a taller one. Is there anywhere to buy the 470? Also, is there an inexpensive carbon base that will fit my 717 fluid head? @Vitaliy, sorry — just noticed that. Will open a new thread.